19th-century gold-tooled tan morocco by Behrends. Johanne La Poullette; Walter L. Nash; purchased by Curt F. Bühler at Sotheby's (London, July 18, 1955, lot 120). 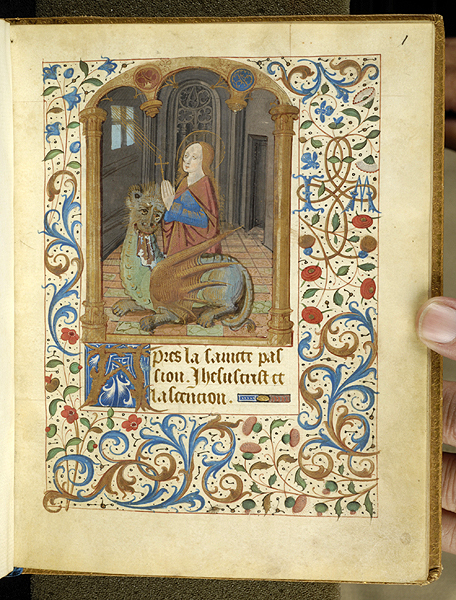 Ms. vie de sainte marguerite, saint's life; written in French verse and illuminated in northern France in the last third of the 15th century. Decoration: 1 large miniature, 1 small miniature, 1 full illuminated border, 1 partial illuminated border, numerous illuminated initials and line endings.